As a valued Merrill Accolades® American Express® Cardmember, you are eligible for a complimentary membership in LOUNGE CLUB™. Once you enroll, you will have access to over 350 participating airport lounges worldwide. Get started today by entering the invitation code provided in your welcome kit. Relax in an exclusive airport environment. Catch up with work or keep in touch with the office. Join LOUNGE CLUB™ with no annual fee. Your first 10 lounge visits are complimentary, which apply to member or guest visits. After your first ten visits, your credit card will be charged US$27 for yourself and any accompanying guests. Enter your invitation code on the upper left portion of this page. 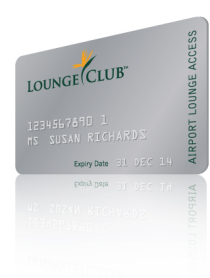 LOUNGE CLUB™ will process your membership and send your membership credentials.